Wow, is it ever summer here! It is hot hot hot and muggy today! That on top of the fact that we crammed a ton into one weekend as well as having a full week, yep, all signs of summer! Here is the plan for the week, again, not a TON of meal planning going on, but definitely keeping busy! Wednesday - Getting ready for the weekend, grocery shopping and dinner at the boys this is a favorite and easy to whip up, along with rice and steamed broccoli. Thursday - Transformers, have to see this on the big screen, we missed the first one on the big screen. Dinner will be out, not sure where yet though. Friday - Up to the lake, dinner at McBee's! Sunday - both sets of parents up at the lake, we are supposed to discuss what we want to do for dinner prior to Thursday, but I think it is going to be ribs! This past weekend was so full, but full of fun stuff! Friday we joined our friends at Canterbury to watch the ponies run! A great time and a wonderful way to celebrate sister S's birthday. It was good to see sister J as well since she is going to be working in SD for most of the summer (just to clarify, these are not my sisters, but the two of them are sisters and very good friends of mine). Great group of people though, and I can't wait to go back again! Saturday the boy and I got some cleaning done around the house while we prepared for my mom, dad, sister and her family to come over so that we could head out to the Metrodome for the Twins game. 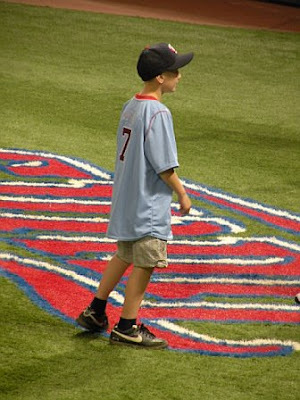 My nephew J, the older of the two, was bat boy for the day which was SO much fun. We got to sit behind home plate for batting practice and meet some of the players as well. Everyone agreed that it was a wonderful experience even though it was a REALLY long day, but the kids were all so good (we left my house at 2:30 and did not get home until 10:30 pm). 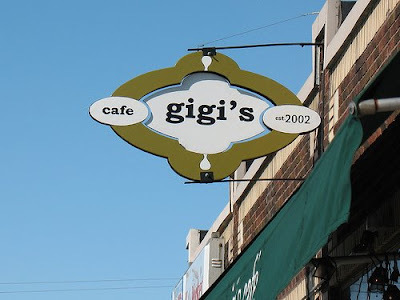 Sunday the boy and I had breakfast outdoors at Gigi's a great little cafe in my 'hood that we both love. I had a lemon chicken pasta salad with dried cherries and walnuts, SO good along with a fresh mixed green salad. The boy had biscuits and gravy which he thought was some of the best biscuits and gravy he had ever had. We ran a couple of errands, discovered some treasures along the way which we will work on up at the lake this weekend (pictures to follow) and headed back to get ready for dinner with the parents. The menu we decided on was this appetizer I highly recommend this, we had it with Italian bread with olives baked in, NUM! I found some great tomatoes for a basil, fresh mozzarella and tomato salad, mashed potatoes, steamed green beans and grilled London broil with this creamy mushroom sauce (I omitted the rum based on the comments). For dessert, I made this pie in the Keebler shortbread crust which I prefer over the graham cracker, but it was a super easy pie and a big hit! I also did not use raspberry preserves but put fresh raspberries right into the bottom of the crust and smashed them up a bit. A great weekend overall, although I am really looking forward to a weekend away now!